This track, generated in near-real time with a SentryGPSid system and displayed on the NYC Swim site, was avidly followed by many people (Johna among them) as the swim progressed. Click on the track to open it in a new tab or window. The red arrows show the direction of the swim; the red numbers mark individual annotations; the blue arrows indicate tidal current directions. 1. 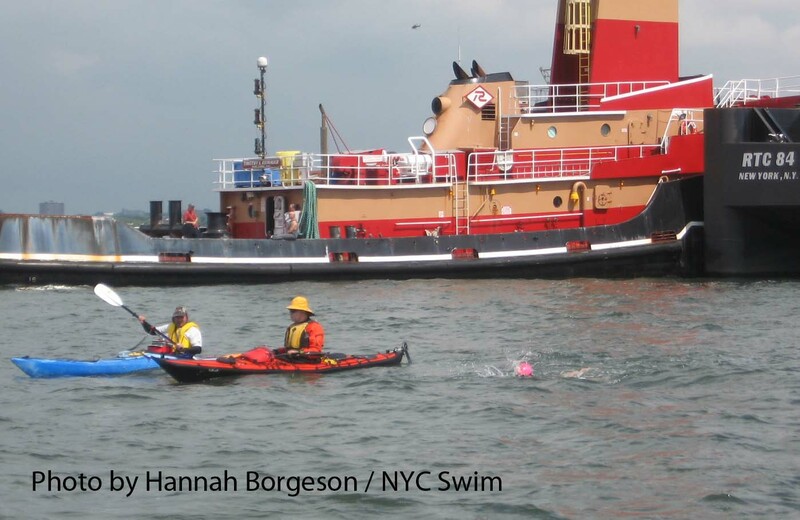 After being interviewed by the media, Liz starts her swim at Gangway One of the Battery, at the southern tip of Manhattan, just after 9:45 a.m.
2. 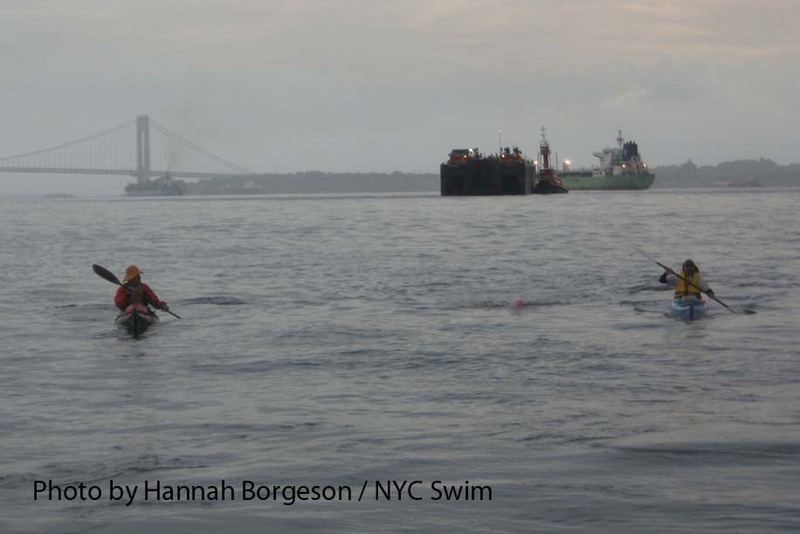 The course was planned with an original start time of 9:15 a.m., when the East River was just beginning to ebb. 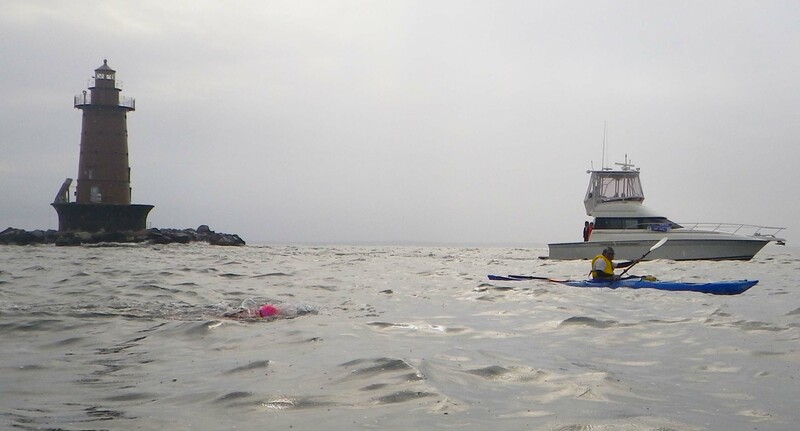 But the start was postponed until 9:45 a.m. so that Liz will reach Sandy Hook ideally just when the ebb changes again to flood for her swim back. That postponement has two negative consequences, one of which now materializes. 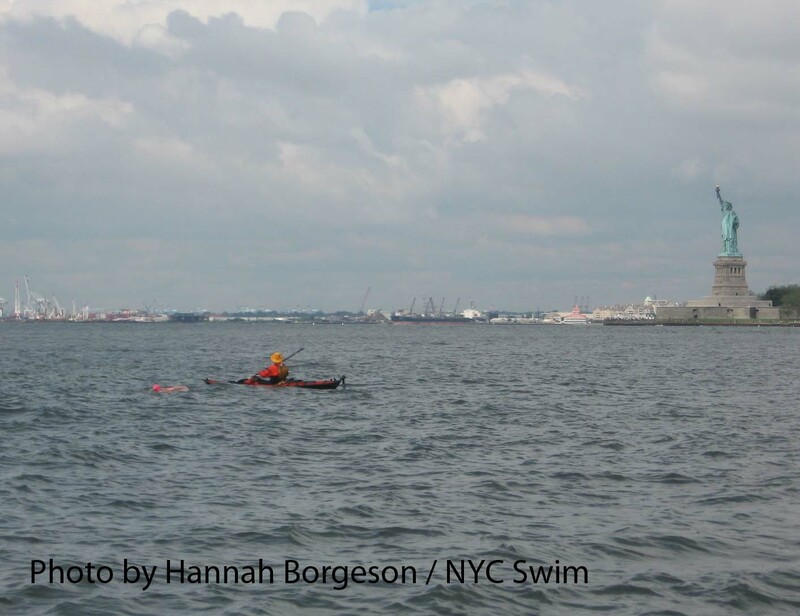 The planned course would have Liz swim down the Buttermilk Channel, to the east of Governors Island. 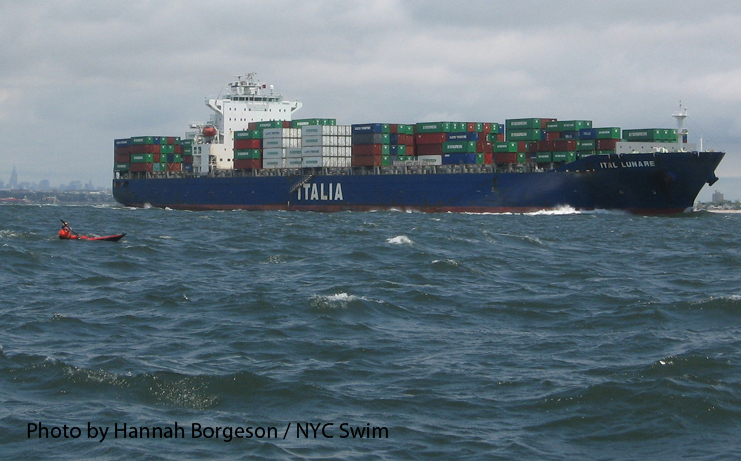 But to get round the northern tip of Governors Island into the Buttermilk Channel requires that Liz swim southeast—and after 9:45 a.m. the ebb current sweeping down the East River toward the southwest is simply too strong. Liz is increasingly swept westward. After a few agonizing minutes, we let the current have its way. (Just as well: persevering would have cost Liz a record, as it turned out.) 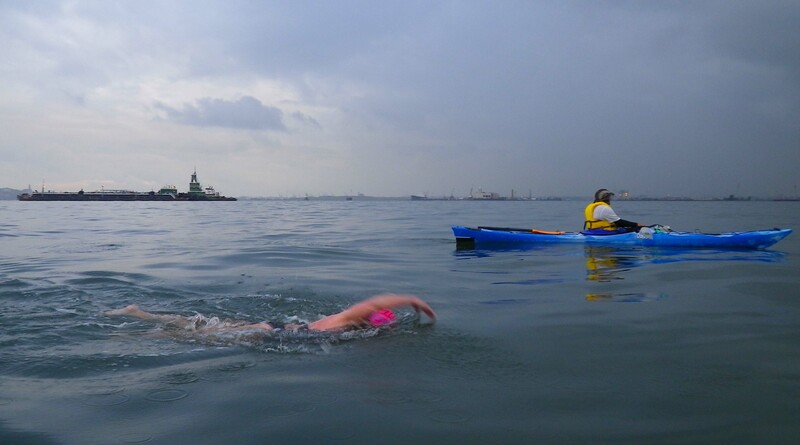 We turn and Liz swims west of Governors Island instead. Soon Manhattan is small behind. 3. 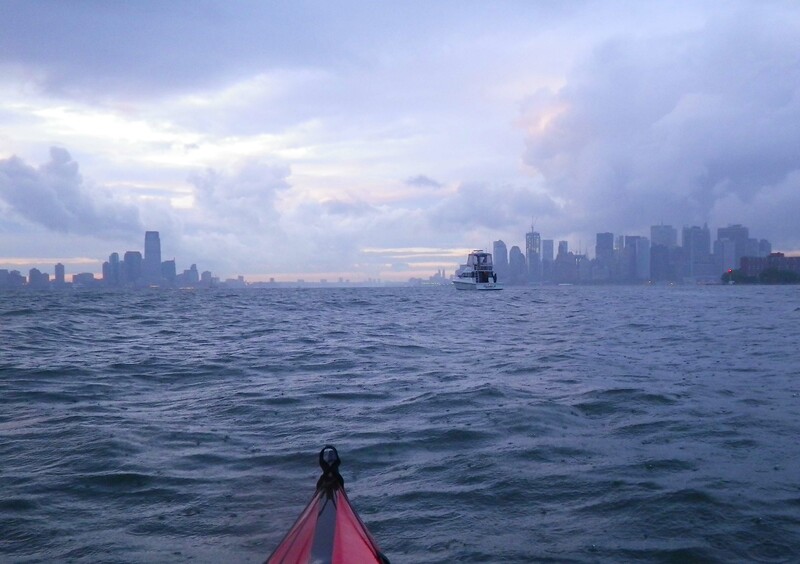 (~10:45 a.m.) With a strong ebb current, moving at 2.5-3 mph by my GPS, we pass to the west of Bay Ridge Flats, threading our way through the rows of tugs and barges anchored there. 4. (~11:45 a.m.) After 2 hours, we are closing in on the Verrazano-Narrows Bridge while diagonally crossing the channel from the Brooklyn side to the Staten Island side. The ebb current’s boiling, and we’re flying at 5 mph. From the support motor boat, the Together II, Morty Berger remarks on the radio, “That’s the fastest she’s going to be moving all day, right here.” (He was right). 5. South of the Narrows, we follow the western edge of Ambrose Channel. The strong ebb current continues, but is now directly opposed by a 10-knot southerly wind. Soon Liz is plunging through a washing machine of steep 3-foot wind-against-current seas. “This is not fun!”, she says at the next feeding. 6. (~1.45 p.m.) At the bend of the Ambrose Channel we diverge from it and its strong current and the washing machine calms down. (Unfortunately we also slow down.) 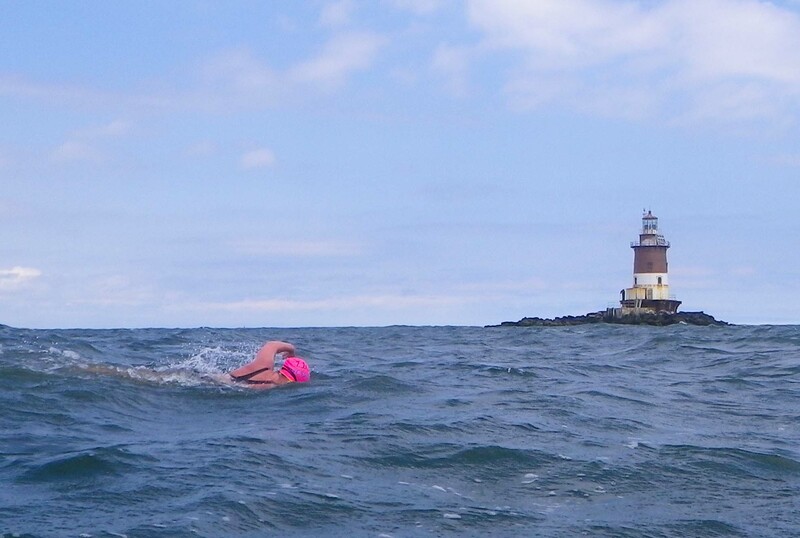 After 4 hours, Liz passes Romer Shoal Light. 7. Although the steep wind-against-current seas are gone, south of Romer Shoal we begin to meet even larger waves, 3- to 4-foot swells rolling in from the open Atlantic. The plan is for Liz to land on the eastern side of Sandy Hook. But off the tip of Sandy Hook, the flood current starts early, and its sets strongly westward. (Indeed, it is this current that built Sandy Hook.) This current is now carrying us increasingly westward as we approach the Sandy Hook shoreline—another consequence of the postponed start. I look at my watch. The beach is close, but so is the record time that Liz has to break. It would take too long if she were to angle into the current to counteract its effect. So I allow her to be carried west while swimming directly for the beach. I hear no complaints on the radio from the Together II, so they’ve presumably made the same calculation. It’s down to the wire! 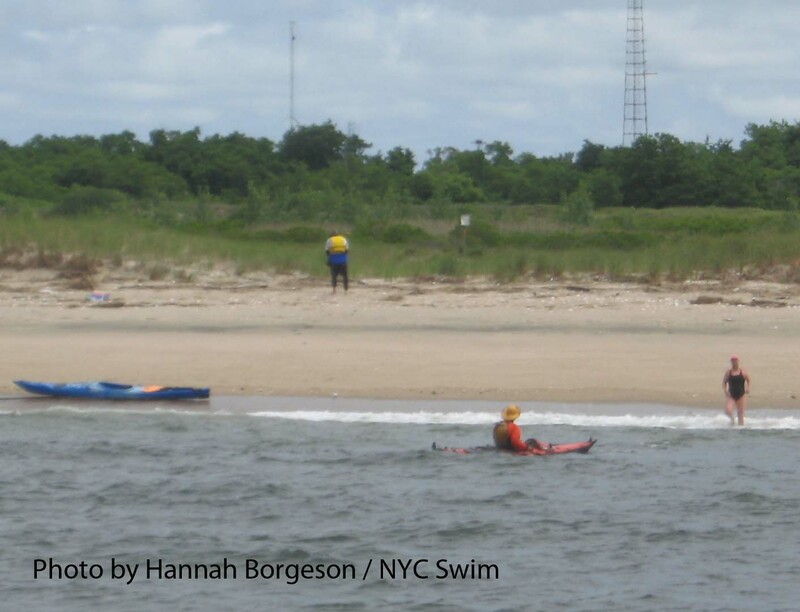 After only a few moments on the beach, Liz re-enters the water and swims to the Together II to chat with the crew. Everyone relaxes; smiles and congratulations all round! 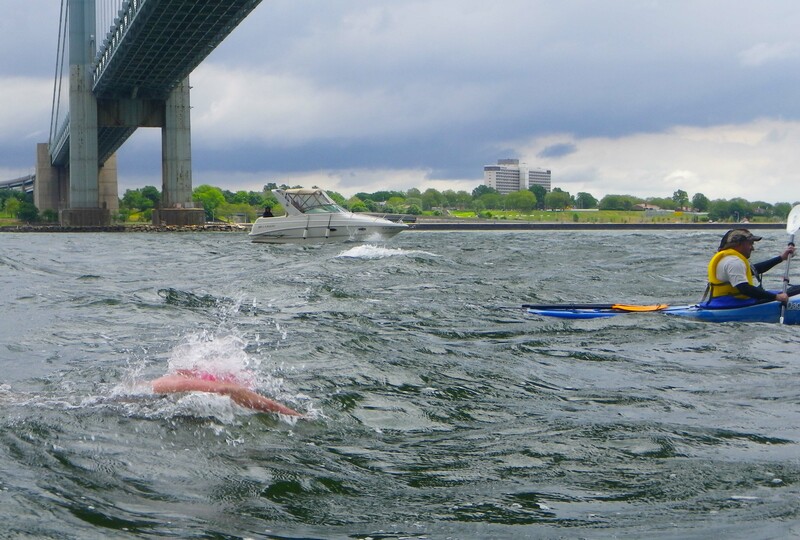 But the harder swim back to Manhattan is still to come. 9. After a few minutes Liz starts swimming north. 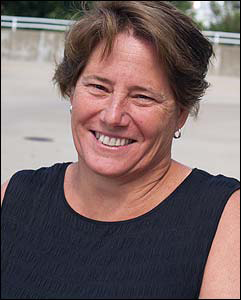 But now there is a price to be paid for Liz’s record: we are on the western side of Sandy Hook, where the flood current continues to carry us west, away from the more northward current of the Ambrose Channel that we really want to reach as soon as possible. We do the best we can. Angling into the current, we aim for Romer Shoal Light, even though clearly the current will take us far to the west of it. At that angle, we are creeping along only at 1.5 mph—but if we gave in to the current completely, we would wash up on the south shore of Staten Island. No wonder I look glum in the picture! Liz can feel our slow progress, but does not complain. She swims steadily along, for what seem like endless hours: a job that needs to be done. 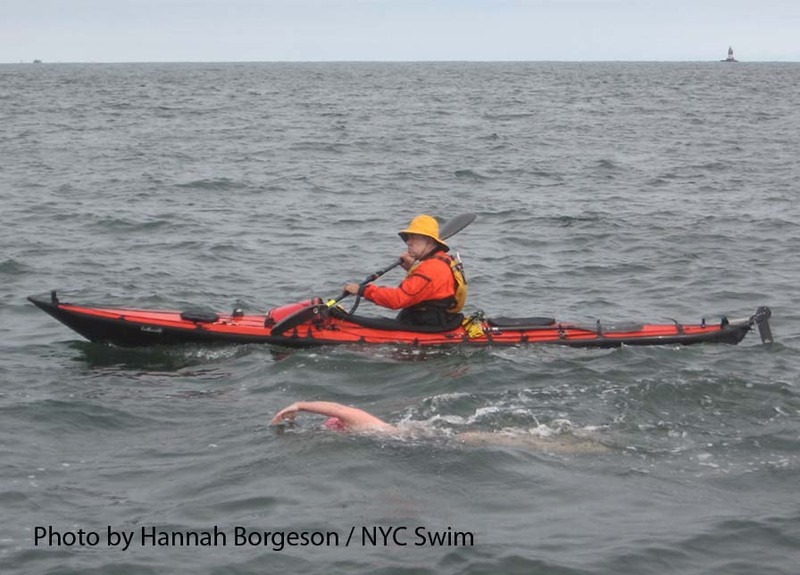 After 7 hours in the 65-degree water, however, she requests a hot drink at the next feeding. 10. (~5:15 p.m.) Finally, we reach West Bank Light, where we begin to pick up faster current northward. The wind has ceased, and the afternoon sunlight reflects off the smooth pewter-colored water. 11. 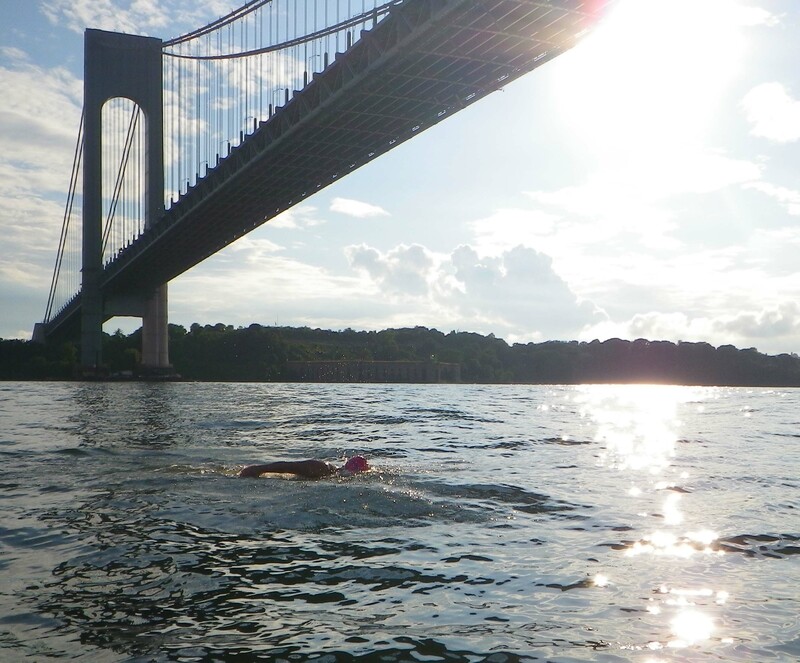 (~6:30 p.m.) We pass back under the Verrazano-Narrows Bridge. 12. 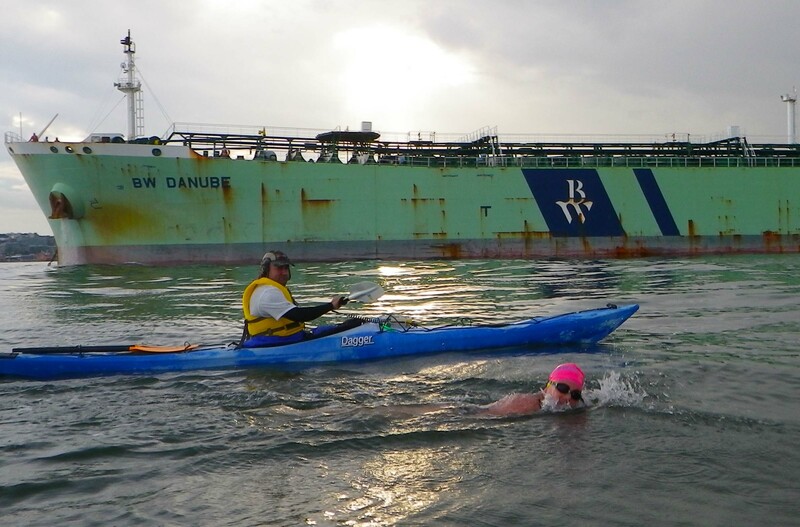 (~7:15 p.m.) I tell Liz Morty’s assessment: she can finish the swim in daylight, but only if she picks up the pace a bit. Otherwise the swim will end much more dangerously in darkness, which everyone is nervous about. 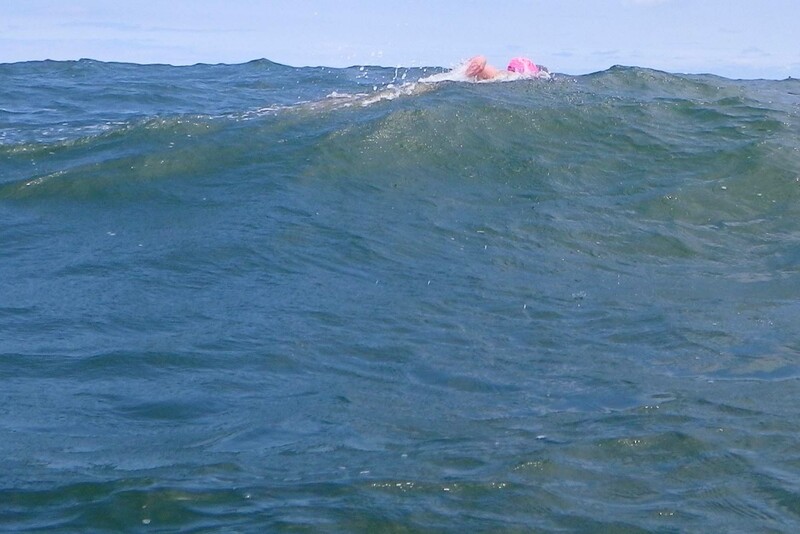 I am thinking of an even worse thing: the current may turn against her, which could prevent her from completing the swim altogether. The current should not begin to ebb until 9:30 p.m. or so, but currents are fickle and it will be a close thing. Liz requests a treat: a couple of Pepperidge Farm cookies. And immediately she begins swimming much more aggressively. We should have done this before! The current suddenly strengthens too, and we are moving at 4 mph. Tensions ease. 13. 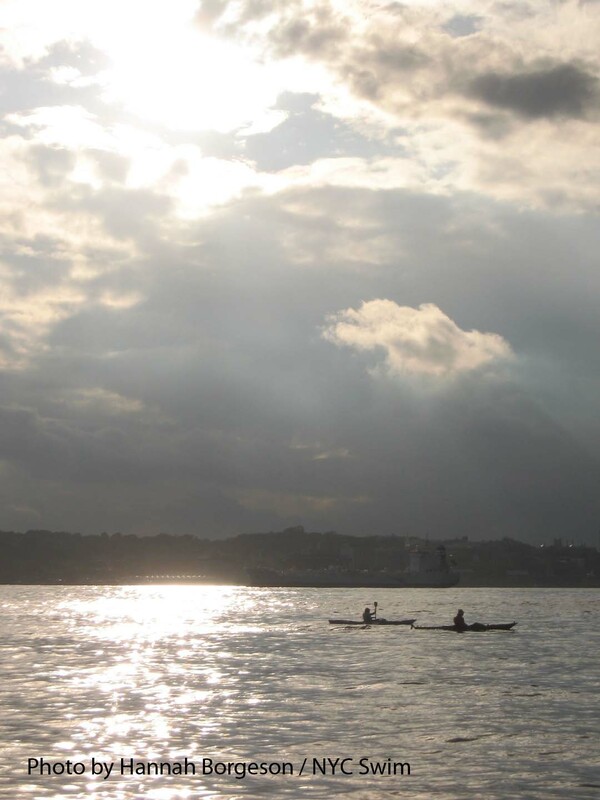 We thread our way back through the rows of ships and barges anchored off the Bay Ridge Flats. 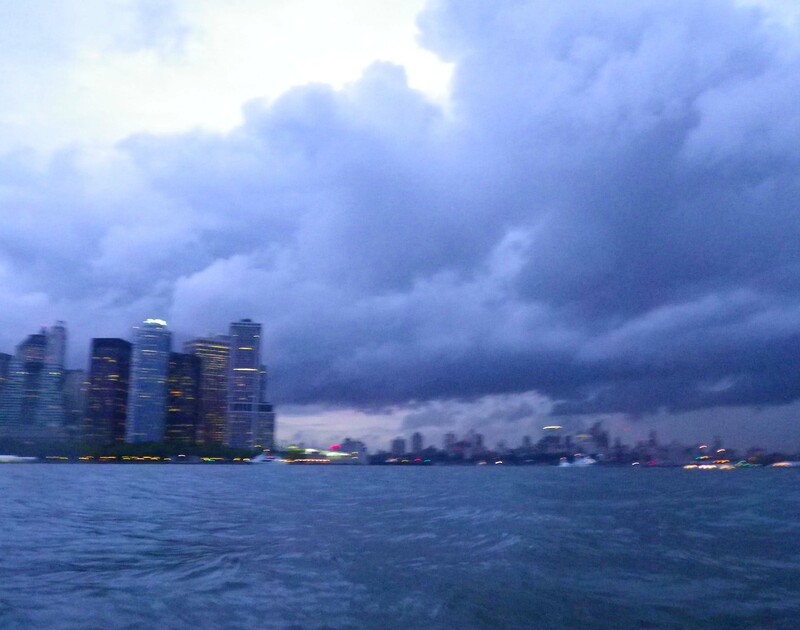 It’s getting dark, prematurely: rainclouds are gathering. 14. (~8:15 p.m.) A brief rain shower, then clearing over the Manhattan skyline that has been teasing us for an hour, growing ever so slowly larger. We are now at Governors Island, but we are losing our flood current! Our second motor boat is sent to scout for current; it reports significant flood current still up the middle of the harbor. So we head out into the shipping channel. I am happy that we have two motor boats to watch for traffic in the gathering darkness. We turn on lights on our kayaks. The Together II gives us lighted goggles for Liz if she needs them. 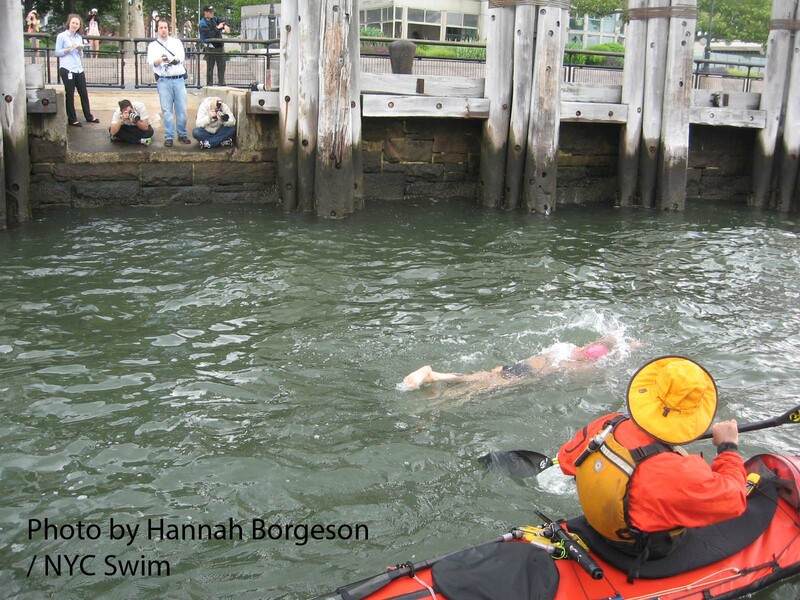 Finally at 8:50 p.m. Liz swims into South Cove. The Together II joyously sounds its horn, but Liz keeps on swimming—straight into a log! She recoils and curses. We laugh and tell her she’s done. Now she tells me she is looking for new challenges. Uncredited photos are by Vlad. 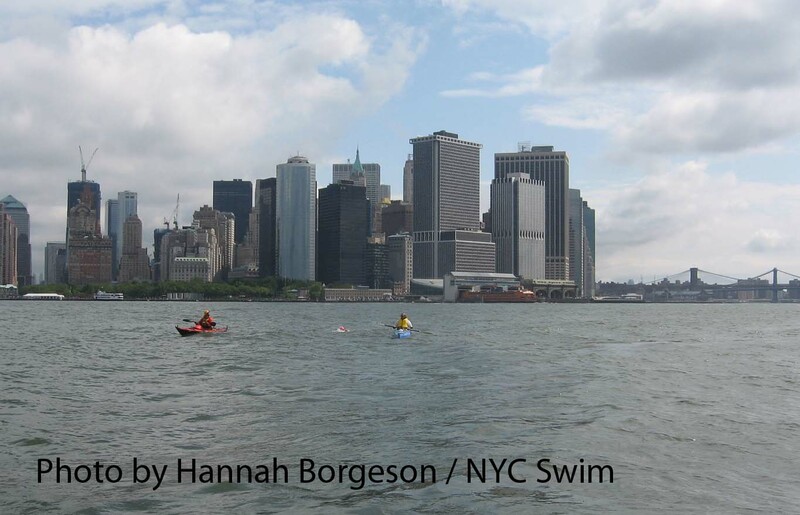 All of Vlad’s photos from the swim can be seen here, all of Hannah Borgeson’s photos here. 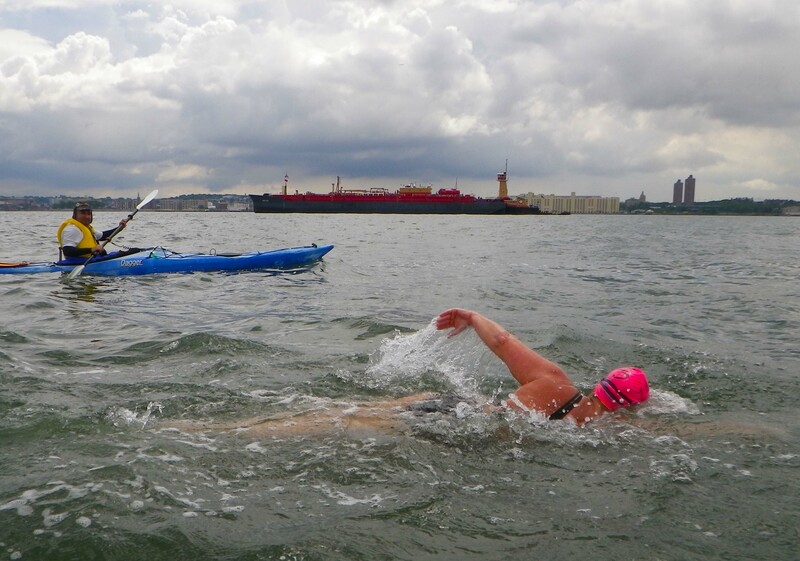 A report of Liz’s swim in NYC Swim’s Cross Currents Newsletter is here. Press reports: Associated Press, New York Post, NY Daily News, CBS New York, Westport Now. 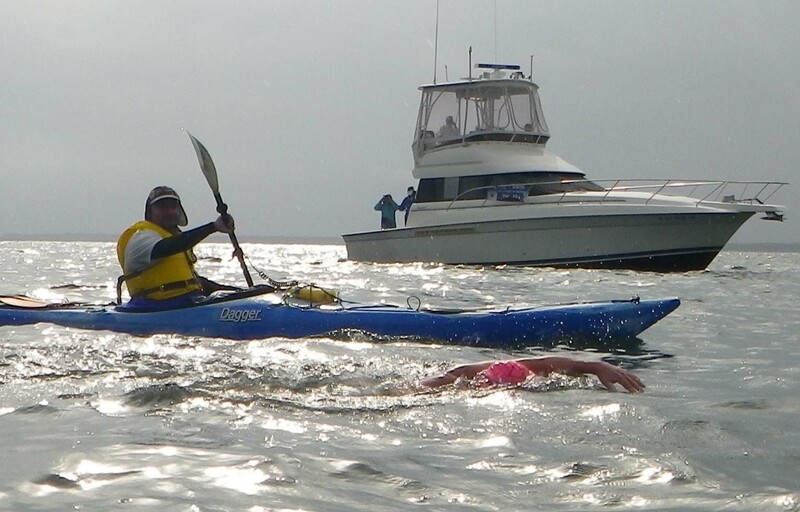 Fantastic account of a very complicated swim! 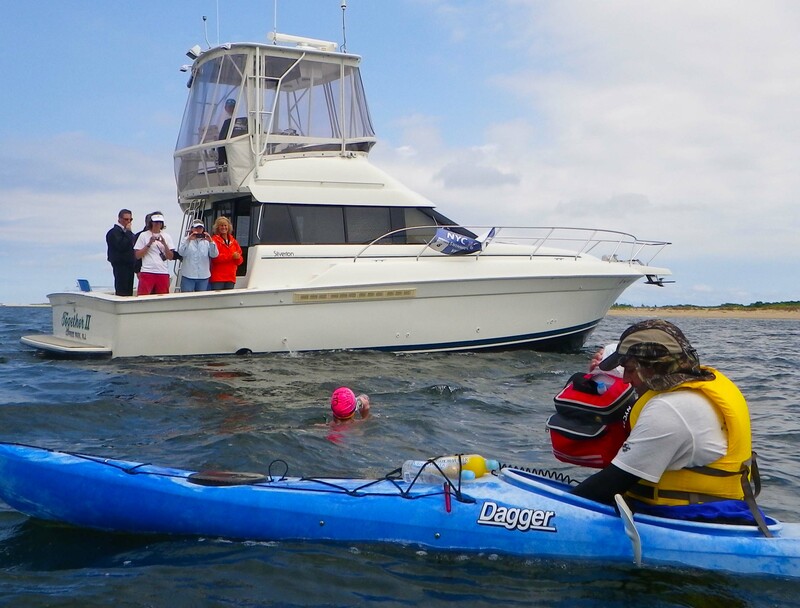 Congrats to swimmer, paddlers & pilots – all deserve much credit. I believe you are swimming in the one-way Ederle in October? That is less complicated, current-wise, because it’s possible to pick the start time so that the current is optimal JUST for the swim down, rather than compromising so that it’s good enough for both the swim down AND the swim back. Basically, you start a bit earlier in the ebb, so there isn’t the problem with getting round Governors Island, and you arrive at Sandy Hook while the ebb is still pretty strong. Of course, at that earlier stage in the ebb the current tries to sweep you east, out to sea, so that it’s easy to overshoot the tip of Sandy Hook and land somewhere on the eastern side, losing time in doing so….